Although we`re not that much in all this Christmas Mumbo Jumbo, we`ve decided to invite guests this year to compensate our being far from home, families and friends. And the clubs or bars for the After-Mumbo Jumbo. In my girlfriend`s company about a dozen of her Chinese co-workers sacrifice half their lunch break every workday to meet and build up a DIY (or TeachIY)-german class, with one of them having lived in Germany for two years being their teacher. Everybody knowing what role food is playing in Chinese culture ("Eating is the heaven of the simple man") can understand how big the sacrifice is these guys take. As we`ve been out with them for Karaoke and Dinner before, we knew they were a lively bunch of wonderful and nice people hanging out with would be fun . So my girlfriend invited them, ten came, two bringing their children. A few days before Christmas invitations made by the Chinese circulated through the company`s intranet, speaking of "exclusive outfits and masks welcome". Well, we didn`t bother much explaining that this is a different celebration a couple of months later, we weren`t planning a contemplative evening anyway. What we had to put some thought in was what we`d serve for dinner, as of course the menu should be as german - or at least european - as possible. But dinner was just a tiny part of the eclectic Christmas Eve programme. When you invite Chinese people over, you should have that - a programme, that is, a plan, a schedule what you`re about to do in the time you spend together. There`s seldom a mere casual "hanging out" - Chinese guests want to be entertained. So we started in the afternoon with jointly decorating our Christmas tree - a 2m plastic fir from Carrefour. As I already mentioned, I´m actually not that much into Christmas, maybe because I´m coming from a rather small non-religious family where Christmas never was that big a deal, and we never really sang songs. So this Chinese-German Christmas choir become my maybe most remarkable Christmas experience so far. So far away from home - weird. After that we exchanged gifts - as we had prepared one for everyone I put on a Santa costume (30 RMB at Metro :-) ) and gave them out. Was fun. Unfortunately (or luckily?) we have no picture of that yet, as Santa had no time taking pictures while handing out gifts. Maybe I´ll add a picture here when we`ve exchanged photos with the Chinese, as they made plenty. After dinner we went on with playing games, like a mixture of charade and Chinese whispers (funny that`s it`s actually called like that, for Germans: "Stille Post"), which wasn`t that easy because there were mainly 成语 "chengyu" to guess, Chinese four character sayings. There are hundreds, if not thousands of them, and Chinese kids learn them in school, but they`re not necessary in everyday Chinese, so as a foreigner you mostly only know a few, if any. Still was a lot of fun, as they performed wery lively. Although most of the time I had no idea what they performed. It was a great success, as was the whole evening who went on for a couple of hours more with more games,games,games, later on also inluding loads of beer. We got so much out of it, co-workers became friends, we had tons of fun and everybody got opportunities to improve the languages they`re learning. Christmas 2011 is over, but it was an awesome one - the memories will stick. Please defend to pick sincerely - picking hypocritical, on the other hand, won`t be tolerated. Well, the Chinese says something like "cautiously prevent getting robbed". Pretty close. Funniest "translation" of "Beware of pickpockets" I´ve seen so far. 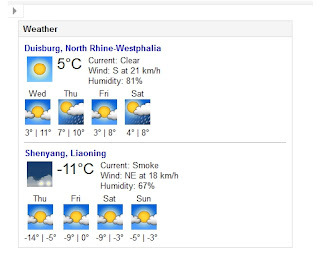 Finally fully equipped Shenyang style for a long hard winter. Or street riots - whatever comes first. Does it smell funny in here? O.k., I admit it, you need to go a pretty long way over two languages to connect those two pictures thematically, but as we "dschörmans" are almost all bilingual, it should work. The pictures show the fronts of little clothes stores in my neighbourhood. For all those who can`t speak German - "Furze" is the imperative of the verb "furzen", which means "to fart". the meaning in german being "fart flat senior school". and still wondering about why the second store gave itself this name. An explanation might be that the Chinese owners mistranslated the character 味 (wèi) as it can have the meanings flavor, taste, fragrant or sometimes smell to choose from. In winter, everybody can be Jesus. Last week I strolled through one of Shenyang`s bigger parks, namely the "Olympia Park". It`s down at the Hun River that`s crossing the city in the south. When I arrived at the river bank what I saw surprised me and made me happy as a child at the same time - as what I saw I`ve seen the last time when I was exactly that, a little child. A huge river, almost completely frozen. With ice thick enough for carrying a person and a vehicle crossing the river. At the beginning of December. Had to think way back to remember a winter in Germany where it was possible to completely cross a river on ice. And I was sceptical at first. But after having seen the dude on the third picture and the bike on the second one, as well as having remembered temperatures having been below zero the whole week and having hit -10°C exactly that day, I dared to walk on the river for a while, as you can see on the last picture. You can easily recognize me by wearing bell-bottoms. For a couple of weeks now the streets and sidewalks of Shenyang are almost literally paved with vegetables. It`s harvest season for the most common produce in China, 白菜 (baicai), Chinese cabbage, or white cabbage, as the Chinese call it themselves. Every day you see trucks loaded with cabbage or leek like the ones on the pictures on street crossings or in front of main gates of residential complexes, selling their load directly from the truck beds. And pretty cheap, too - you pay around 3 Mao for a cabbage, which is about 3,5 Eurocents nowadays. People often buy them in dozens or even more to lay them out in the open to dry (called "shai" 晒 ) . And obviously don`t fear theft, as they put them everywhere, in house floors, in backyards, on porches, on the sidewalks, in front of their shops, on roofs, or, as the last picture shows, even on statues. But who would steal cabbage even in China worth nearly nothing anyway? "A small step forward, a big step for culture"
When something new is about to be built, often something old(er) has to go to make room for what is to come. In Shenyang, as in many bigger Chinese cities, this happens a lot these days due to the fast pace of the country`s economic development and modernization. And of course, if you`re living in one of this older somethings that has to go, in this case a residential block, you`re not willing to leave without at least making a statement of disagreement - sprayed on your walls or displayed in your windows, for example. "I want security - oppose demolition by force"
written in black: "oppose demolition by force" written in red: "my home"
"oppose demolition by force - protect our homes"
I don`t know why this block is about to be teared down, one reason might be the expansion of the central train station nearby, and these houses would be in the way for a passage into this district - so far the train station only has one entrance on the other side. Another explanation might be that often land or house owners get ample compensations for giving away their usage rights to the government or real estate project developers - and occupants get nothing but a date until when they have to move out. But don`t know if that`s the case here, haven`t talked to people living there so far. In China, they put meat in everything - even a sausage into a sweet waffle on a stick. Much to my girlfriends chagrin.